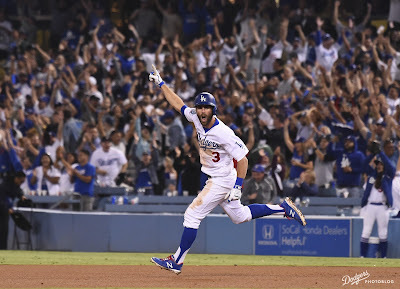 Dodgers Blue Heaven: Blog Kiosk: 9/19/2018 - Dodgers Links - Walkoff Magic! Podcast: Dodgers Nation -- A Holiday in Houston | Episode 20 | Blue Heaven Podcast (Podcast Link). Just like in years past, Topps has just put up their "2019 Vote for Card No. 1" poll. Go here to check it out. As you will see, Clayton Kershaw is one of the choices available. Bring it! Per Alex Pavlovic at YahooSports; "Madison Bumgarner start may be pushed back to play spoiler vs. Dodgers." BTW, the Giants were eliminated from playoff contention several days ago. Peaking at the right time? This is news to my ears! 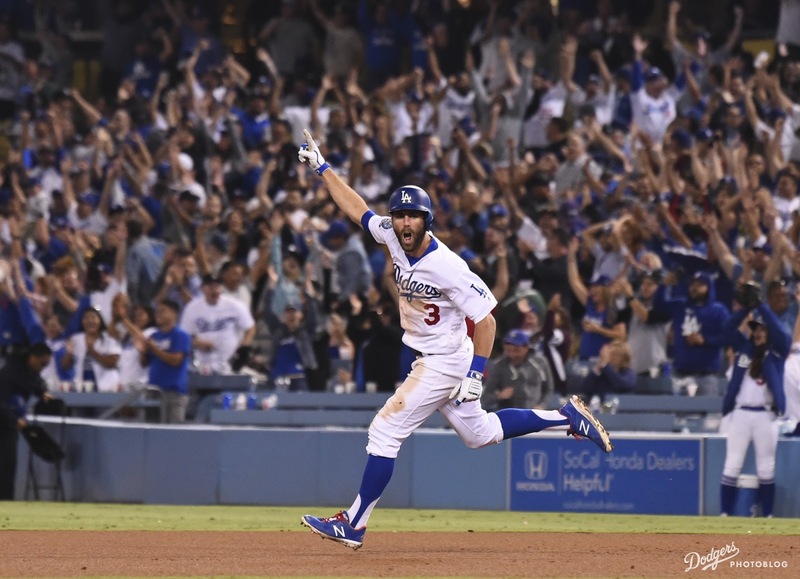 Per Mike Oz at YahooSports; "MLB Power Rankings: The Dodgers are starting to look dangerous." The Dodgers have been up and down these rankings all season. They started high, hung in the middle despite a tough start and dove down to an embarrassing level in May when they were a fourth-place team. After it all, here we are, a week and a half out from the postseason and we might have the most interesting truth of them all: The Dodgers are still the team nobody in the NL wants to see in the playoffs. This event is tomorrow, so if you've got the time I suggest you make the effort to come. Per the South Pasadena Review; "LA Dodgers Exec Ned Colletti Returns to South Pasadena Library." Click the flyer on the right to embiggen. 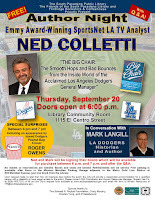 The Ned Colletti Author Night will be presented on Thursday, September 20 in the South Pasadena Library Community Room. 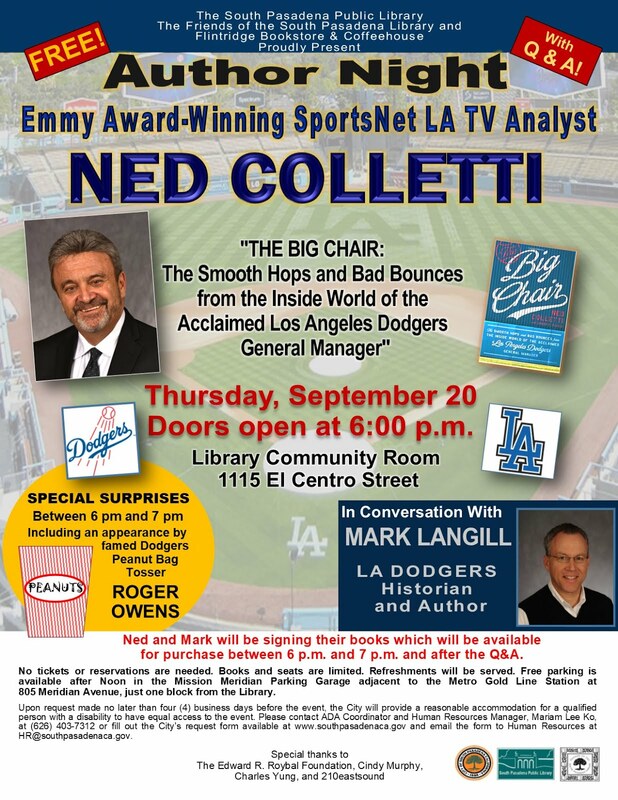 Ned will be discussing his book, “The Big Chair: The Smooth Hops and Bad Bounces from the Inside World of the Acclaimed Los Angeles Dodgers General Manager.” Doors will open at 6 p.m. for the event showcasing Ned in conversation with Mark Langill, an All Star baseball writer in his own right. Jason Martinez at MLB Trade Rumors takes a look at; "The Top Minor League Performers Of 2018." It includes Dodger infielder and former 1st round pick Gavin Lux. Also on the list is former Dodger prospect Dean Kremer -- who was sent to the Orioles as a part of the Machado trade. This is all I really want to know. Per Mike Oz at YahooSports; "Dodgers president on Clayton Kershaw's contract: 'We expect to work together for a long time'"